The BuzziBracks are innovative free-standing modular structures that are all about creating different types of spaces, and new ways of structuring them. 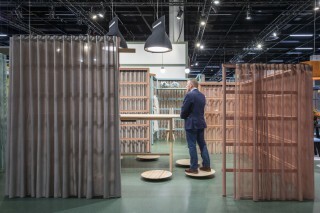 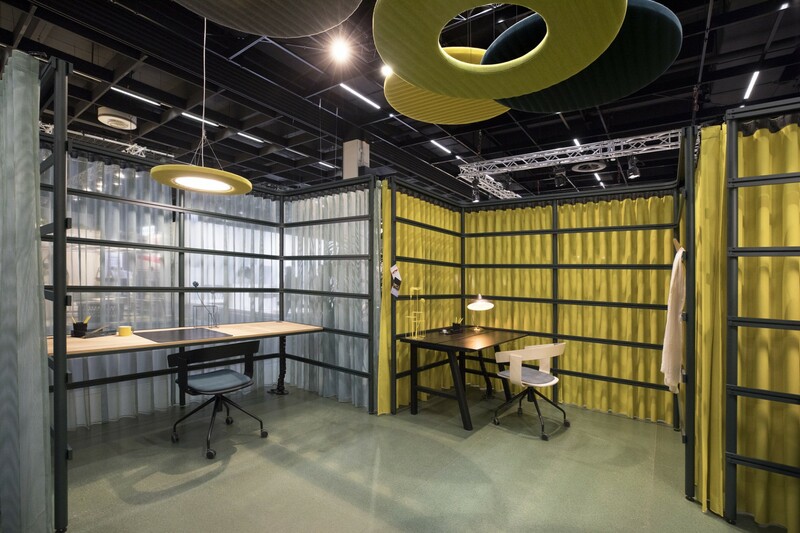 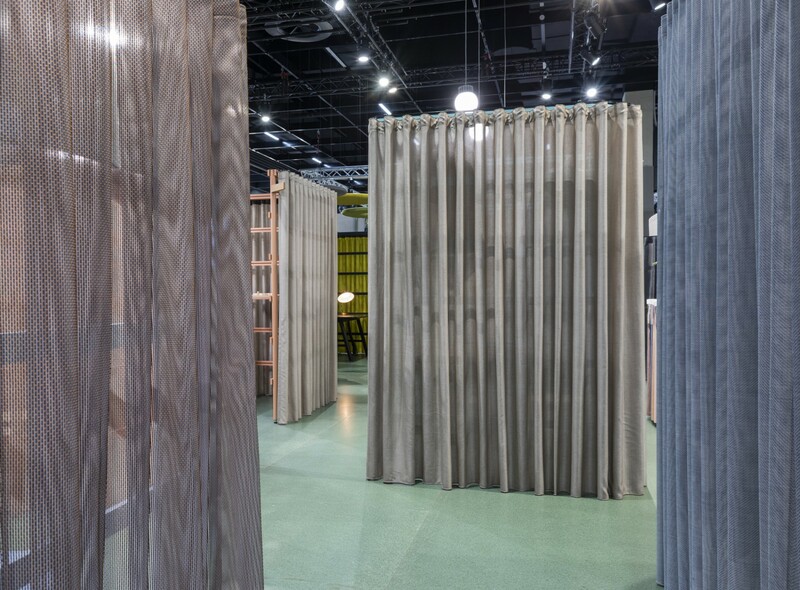 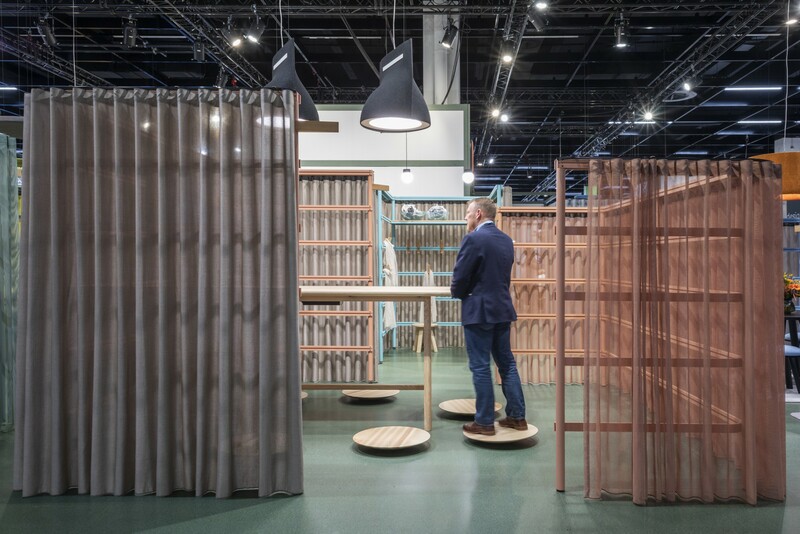 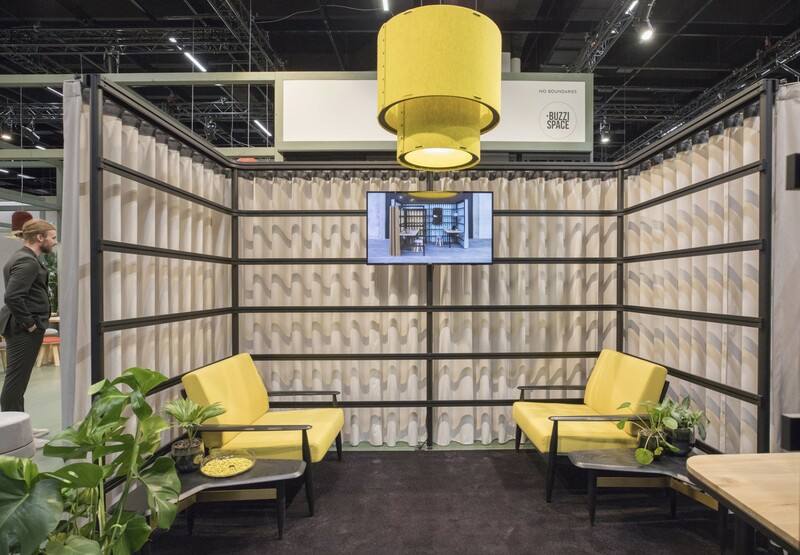 They will, by nature, define more flexible spaces because these modules can easily be repositioned when needed, but also because sheers and curtains are easier to move and manipulate than walls or room partitions made out of hard materials. 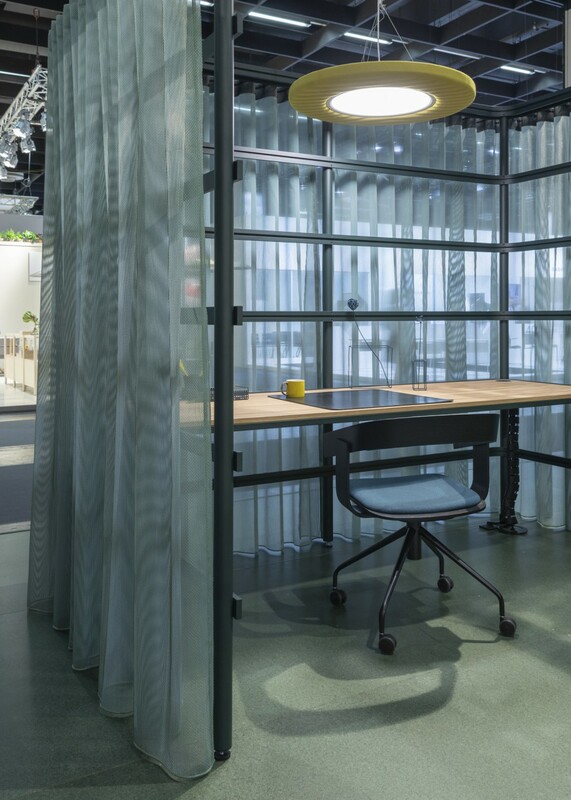 Just like “brackets” in a sentence, they create a protective structure around a moment of life, they generate an increased intimacy and wellbeing in a larger space, a lighter refreshing movement. Depending on how they are used, they could be seen as a parenthesis during the day. The BuzziBracks are designed to be used in two different ways. 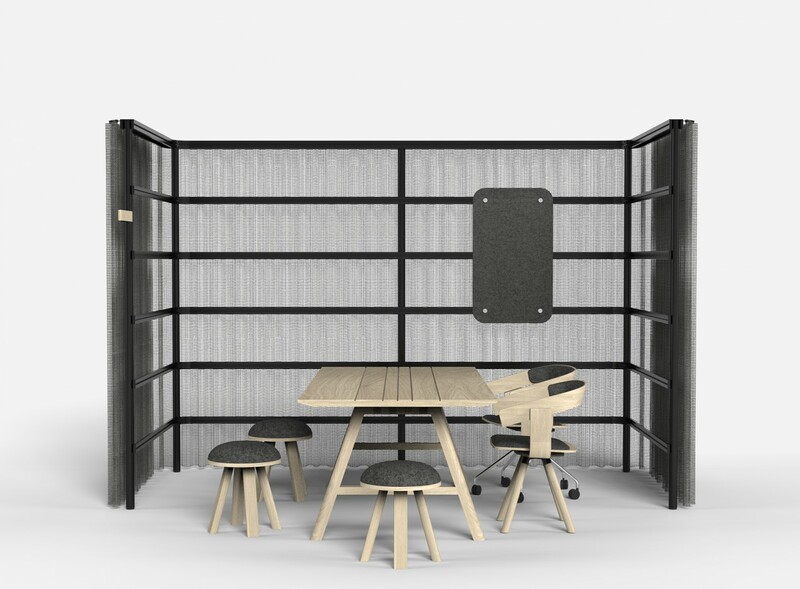 The first as an empty room-within-a-room concept that can be used to define a specific area, that can be furnished by placing chairs and tables, or sofas and armchairs to designate a place to hold a meeting, focusing on a task, sharing a coffee, or getting to know each other. But it can also be used as a plug-in structure which can have several different functions depending on the type of accessories attached (‘plugged in’) to its structure. 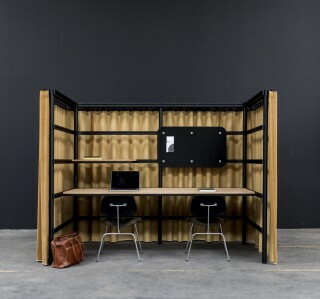 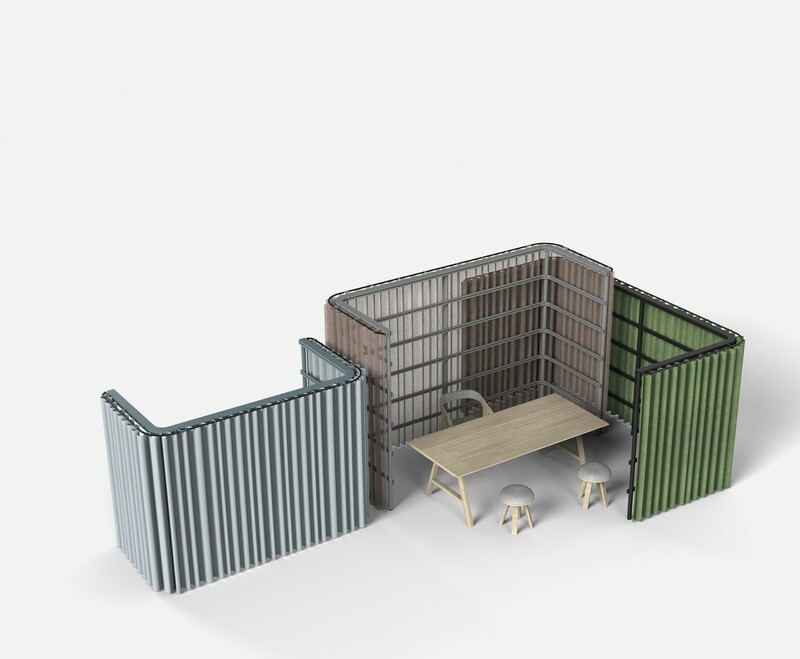 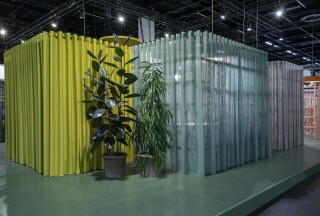 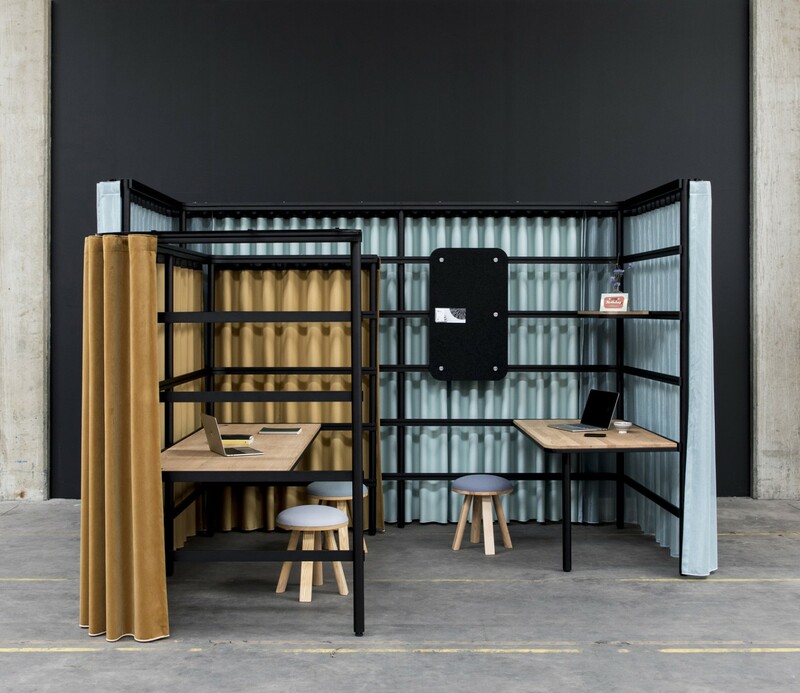 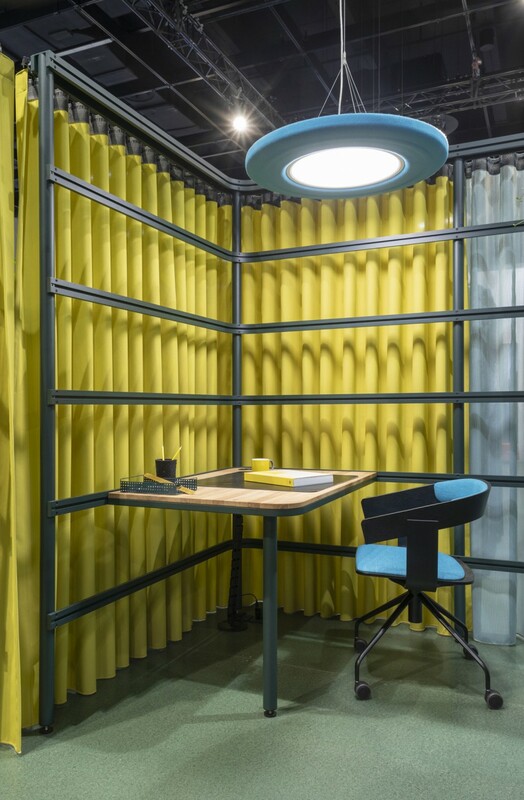 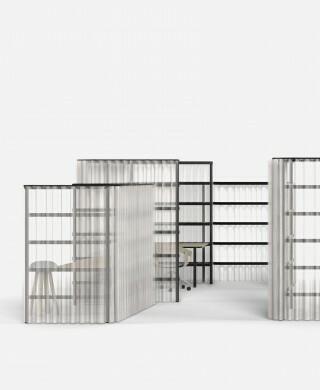 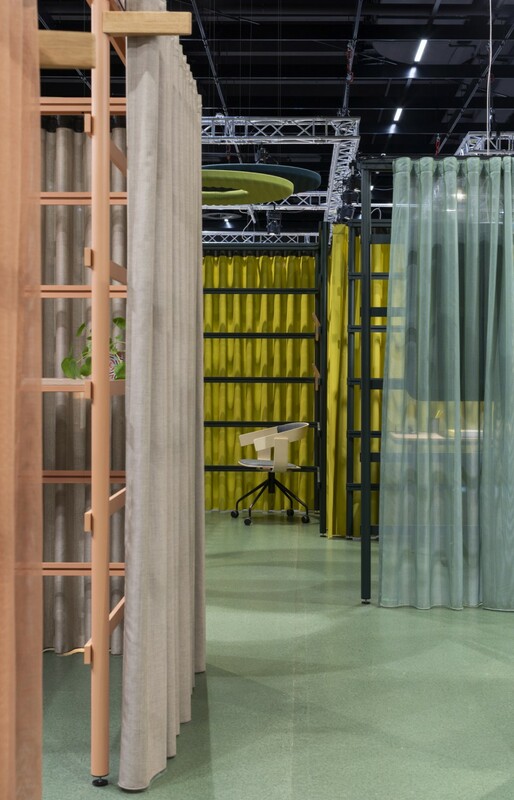 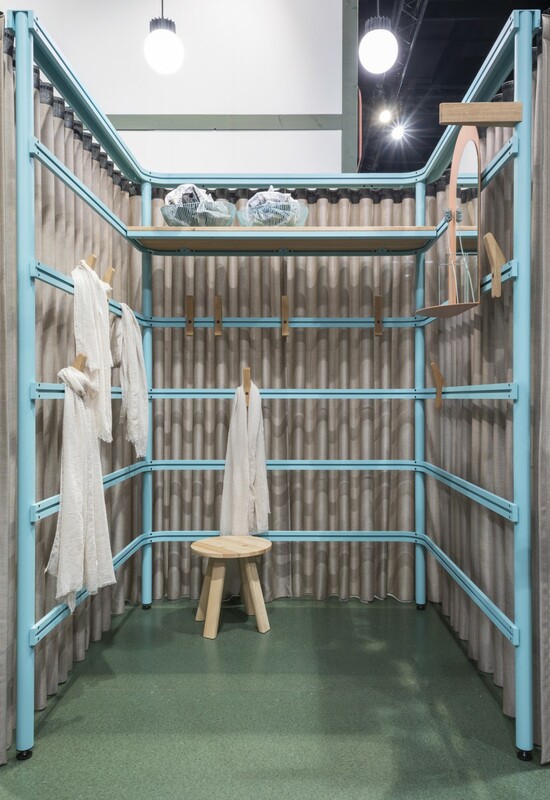 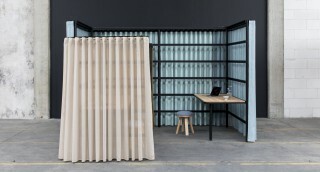 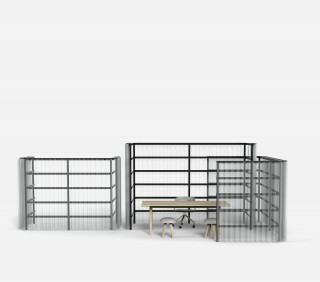 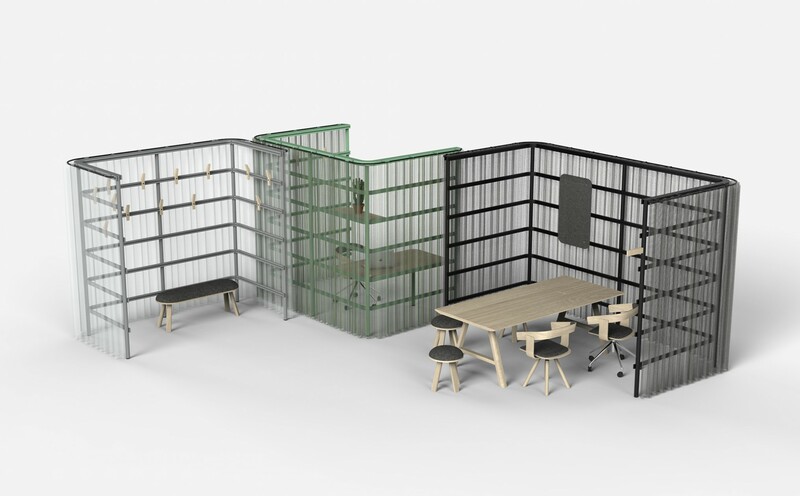 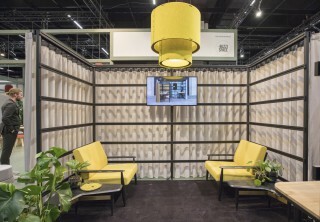 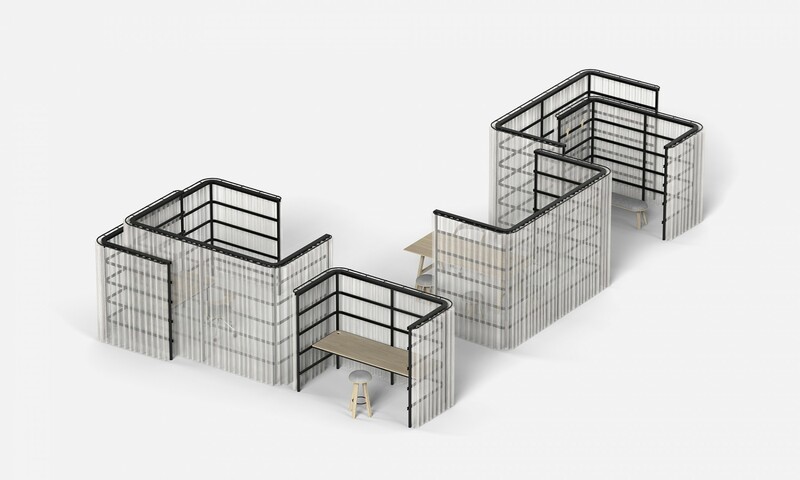 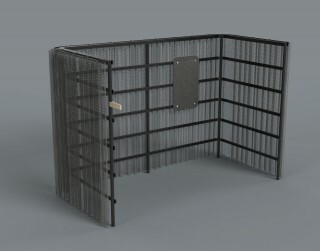 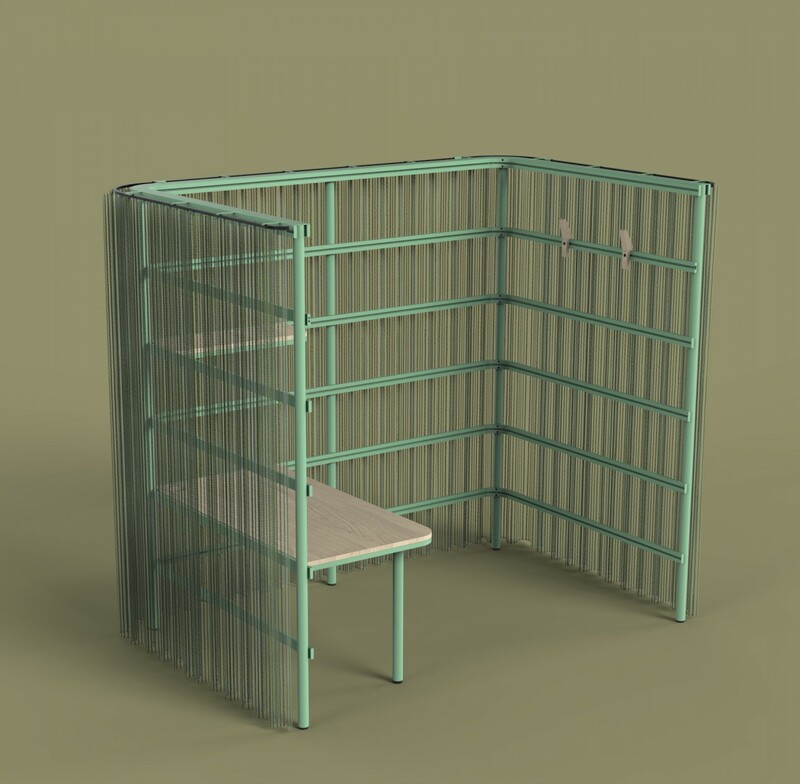 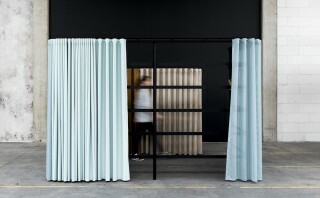 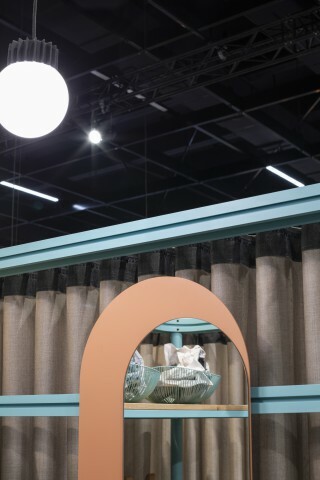 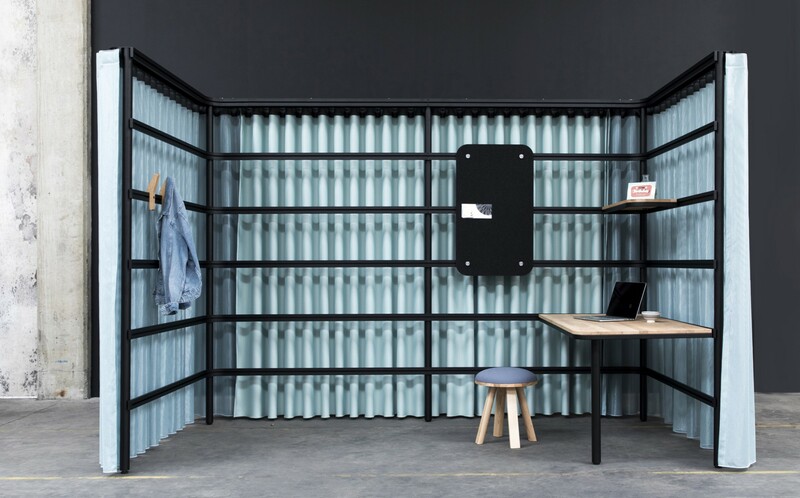 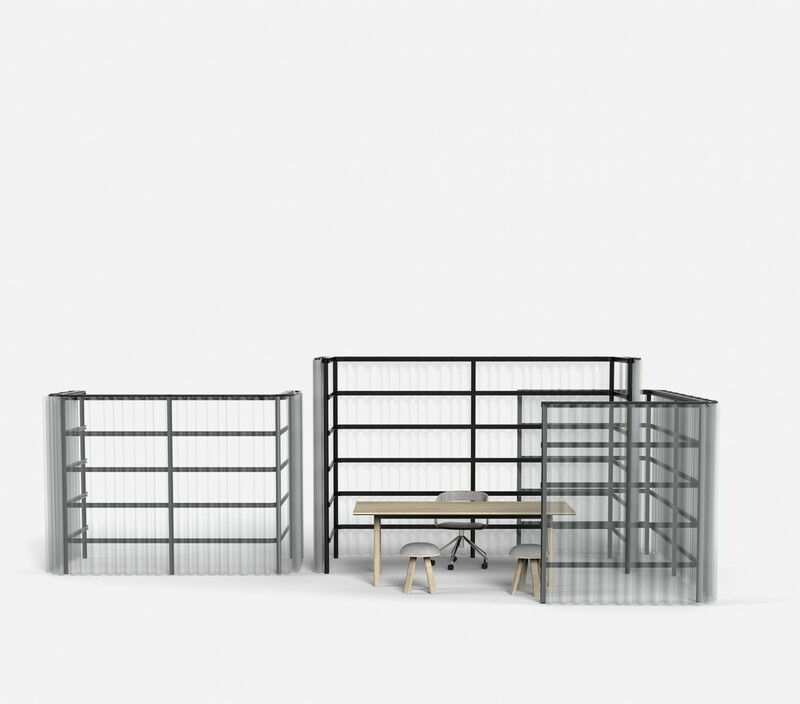 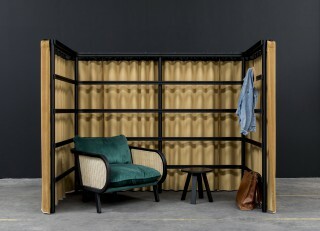 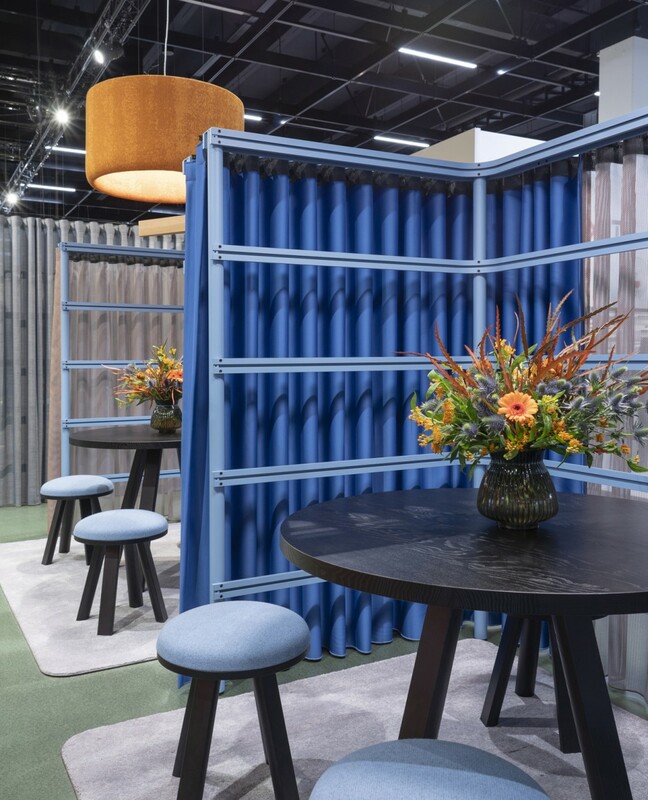 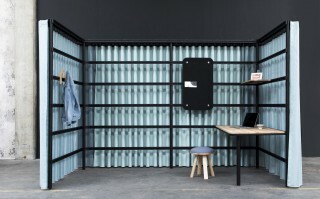 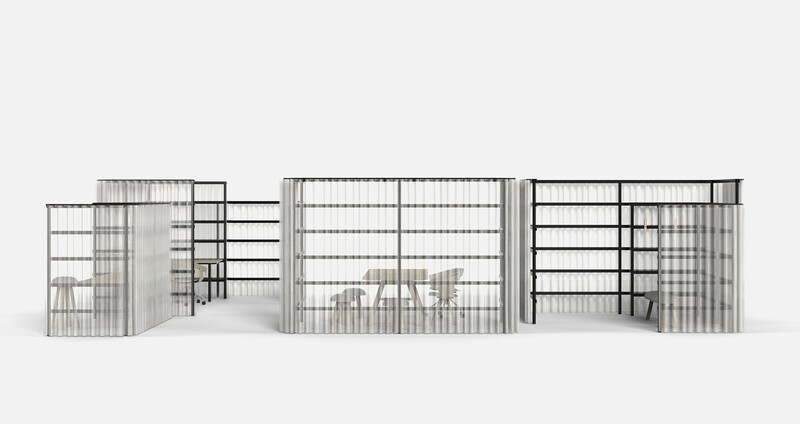 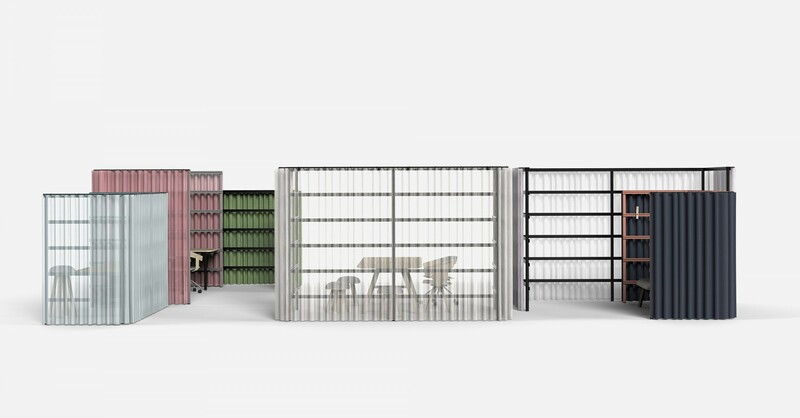 In this case, the structure supporting the curtains becomes a grid that can be used as a base to connect equipment or furniture such as desks or cupboards, smaller accessories like clothes’ hooks, ‘occupied’ signs, pinboards that can be added into the metal structure as needed. This structure is made out of steel poles and aluminium extrusions that have a built-in groove that invisibly connects different accessories. 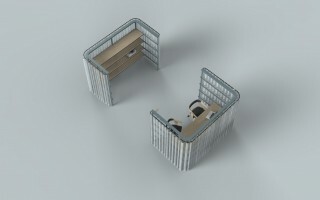 When furniture is connected to it, it has been designed to become a continuity of the structure. 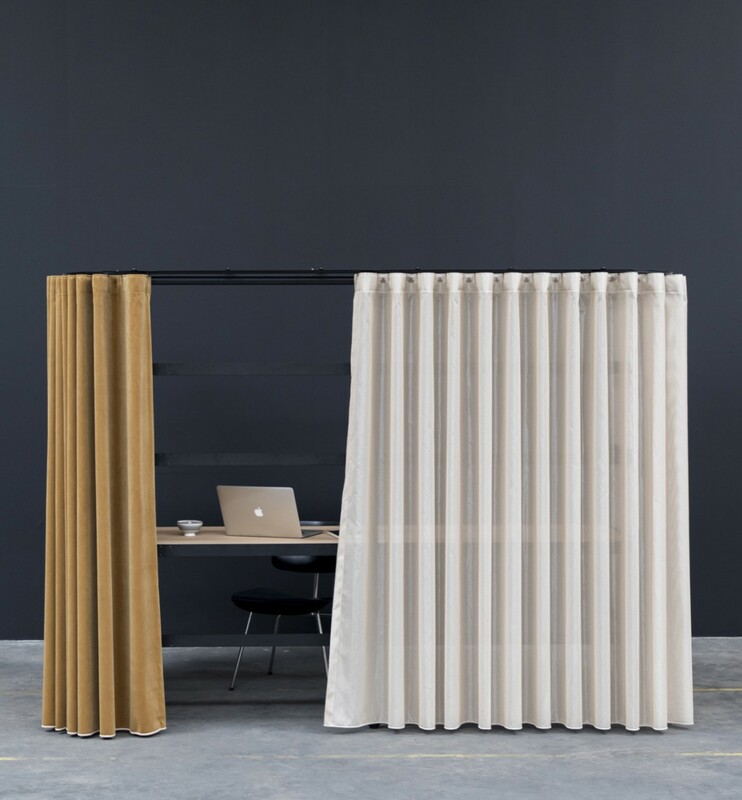 With the use of curtains, one can play with different levels of transparency of the BuzziBracks and create more open spaces by using see-through sheers to slightly blur the view, or decide to use heavier curtains (like velvet) to block the view and absorb more sound. 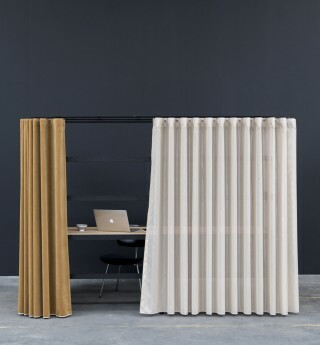 Even the more translucent fabrics are available with a backing that makes them more sound-absorbent. 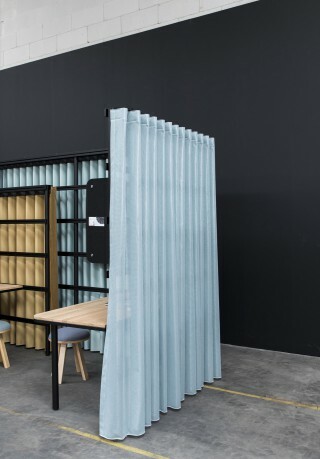 Two different types of fabrics can be used at the same time on a single BuzziBracks so that, for instance, if one side of the module is facing an area with more traffic a blocking fabric can be used while on the other side a translucent fabric can open up space. 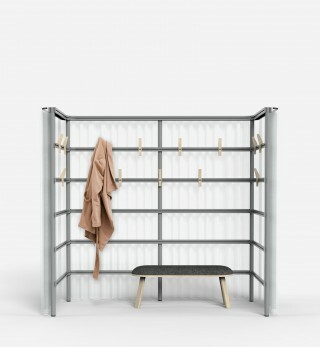 Depending on the function, different sizes and heights of BuzziBracks can be used. 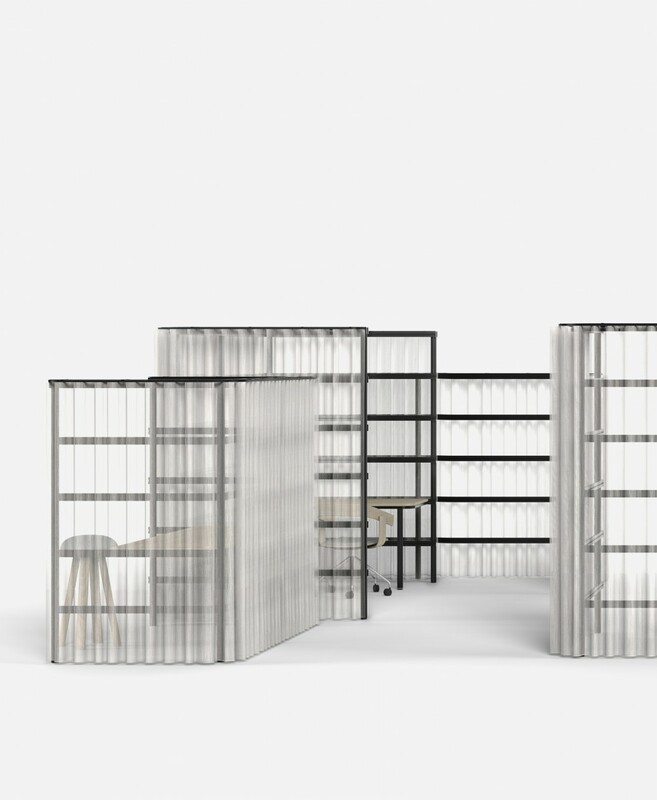 The larger taller one would be perfect for a meeting space; while the version that is not as deep, could be a very useful storage area hidden away from everyone when used with integrated cupboards. 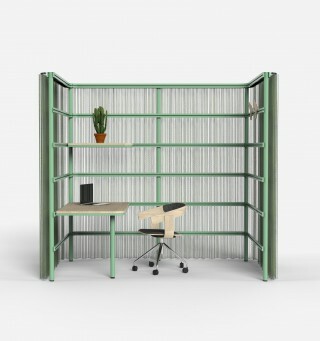 The smaller lower version could suit a personal office very well: it’s all down to the creativity of those using it! 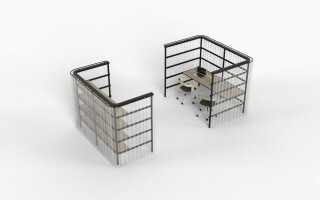 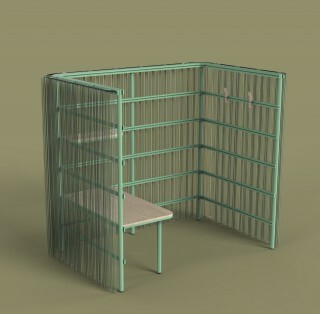 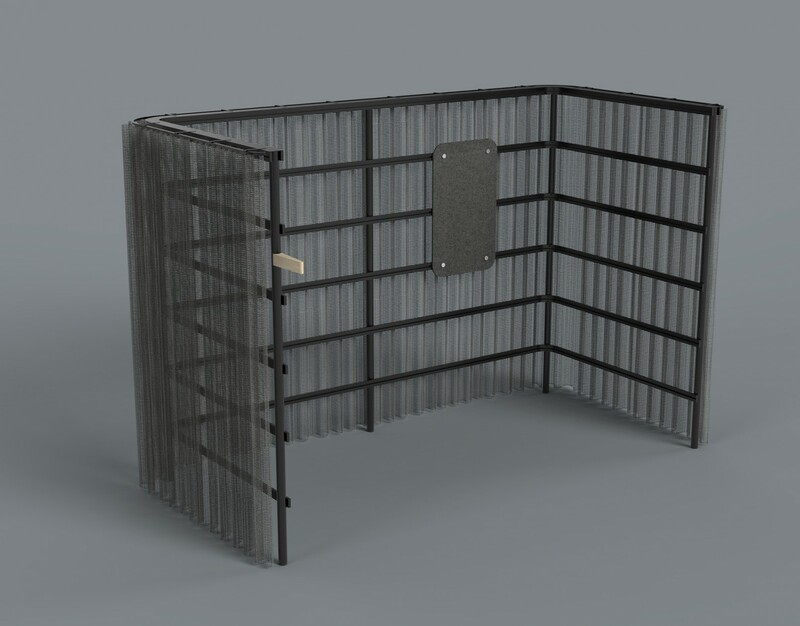 Since they can be quite tall and partially shield a space, the BuzziBracks can be used to structure a large space. 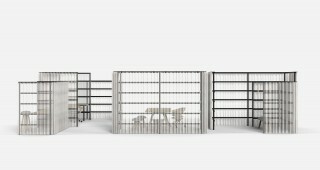 A few of them can also be used together to create a cluster and create an overall dynamic in a larger architectural context. The BuzziBracks are meant to create layers of visual intimacy and structure spaces in a slightly poetic way. 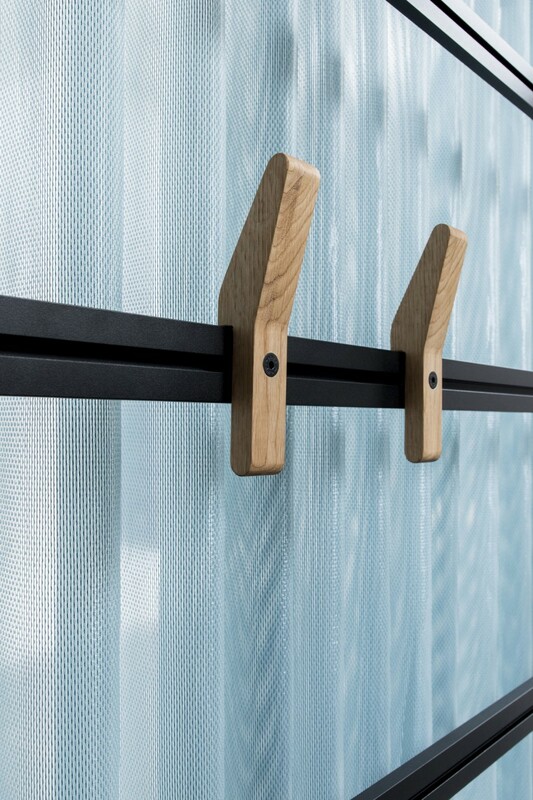 Materials Sheers and curtains, metal, aluminium, wood.